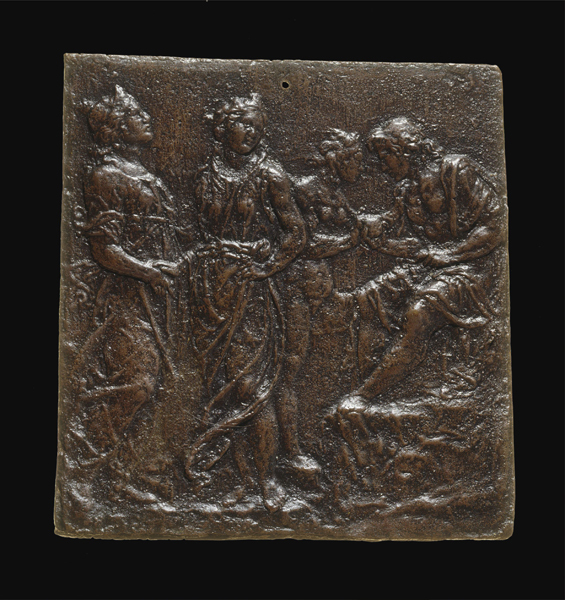 Several decades after Chrysoloras made these observations, artists began scrutinizing antique relief sculpture for authentic historical details. Prior to that, they had tended to depict the history and legends of ancient Greece and Rome using costumes and archaeological settings of more recent times. For example, early Renaissance depictions of the Aeneid (19 BC), an epic account of the founding of Rome by the poet Virgil (70–19 BC), characteristically feature crenellated castles and elegant figures seemingly lifted from a medieval chivalric romance. Graceful Amazon warriors do battle with courtly Trojan soldiers in Episodes from the Aeneid, c. 1470, a cassone panel by Paulo Uccello. Simulating the rich patterning and surface decoration of the late Gothic period, the artist lavished attention on such practical details as ship rigging, equestrian equipage, and helmet design, without evident reference to ancient prototypes. 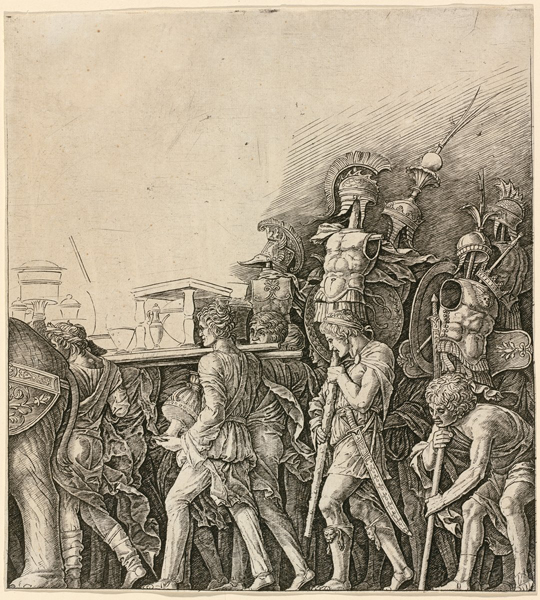 Francesco di Giorgio Martini was among the first artists to cultivate an impression of archaeological verisimilitude in depictions of ancient subject matter. An innovative artist as well as a brilliant engineer and architect, Francesco was well equipped to respond to the rising taste for the antique in his native Siena—a city beginning to take pride in its ancient Roman origins. His influence is evident in the eye-catching pseudo-Roman buildings that signify Carthage in The Meeting of Dido and Aeneas, a cassone panel produced by his studio in about 1480. According to Virgil, the city dazzled Aeneas and his men. Though founded only recently by Dido, Carthage already featured an extensive network of walls and gates, lofty towers, a citadel, and a golden shrine to the goddess Juno. 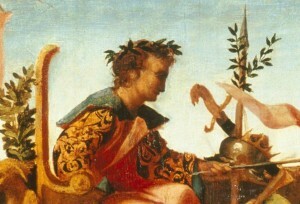 Francesco adopted many of these details in his painting. The hexagonal temple of Hera, in the left foreground, conveys an impression of the grandeur of Carthage through its inlaid marble ornaments and medallion-shaped relief carvings. Enthroned within the temple, Queen Dido greets Aeneas and the other Trojans who disembark from the ship at far right. The lines of the inlaid marble pavement impose rational order on the expansive and spatially ambiguous cityscape. Apart from these self-conscious allusions to the antique, the painting relies on Gothic and Renaissance materials. The towers and spires in the distance and the crenellated fortress at far right present a fantastic patchwork of Gothic and Renaissance architectural styles. The elegant figures have more in common with medieval tapestry than with ancient sculpture. The confusion of styles perhaps reflects the number of hands participating in the work, for Francesco relied on workshop assistants to keep pace with the burgeoning demand for his paintings. His sculptures, by contrast, appear to have been more independent efforts. 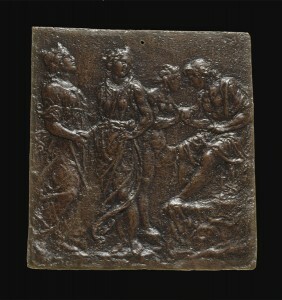 The Judgment of Paris, a bas-relief of c. 1475–80 , demonstrates a sophisticated and sensitive approach to classical conventions in its idealized treatment of the draped human body. Representing ancient Carthage required an imaginative leap. In representing ancient Rome, however, artists found themselves on familiar turf. In the painting the Triumph of Camillus, c. 1470/75, Biagio d’Antonio rendered the city of Rome by means of a capriccio, an architectural fantasy, combining famous landmarks and invented architecture. At left are two immediately recognizable Roman buildings, the Pantheon and the Mausoleum of Hadrian, hemmed in by an assortment of pseudo-classical and Renaissance structures. 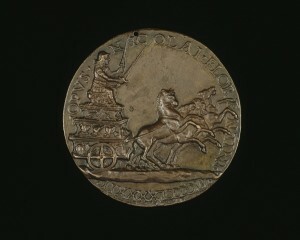 The representation of Camillus also relies on antique prototypes. His head (in profile, encircled by a laurel wreath) resembles portraits of Roman emperors on ancient gems, coins, and medals. 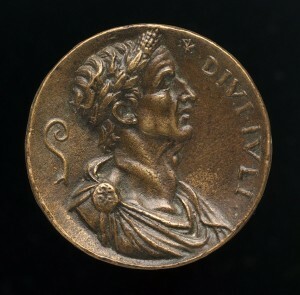 Modern bronze copies were widely available, such as an early sixteenth-century plaquette representing the laureated bust of Julius Caesar, possibly based on an antique intaglio in the Medici collection. Increased knowledge of antiquity steadily raised the standard of historical authenticity in Renaissance images of the ancient past. The Triumph of Caesar, c. 1510, attributed to Palma Vecchio, is one of three panels illustrating episodes from the life of Caesar that may once have constituted a frieze. Here again, the depiction of a famous historical figure—the greatest soldier of the Roman era—would have conferred an aura of righteous virtue on the patron who displayed it. The painting represents a complex amalgamation of ancient and modern archaeological and textual sources. 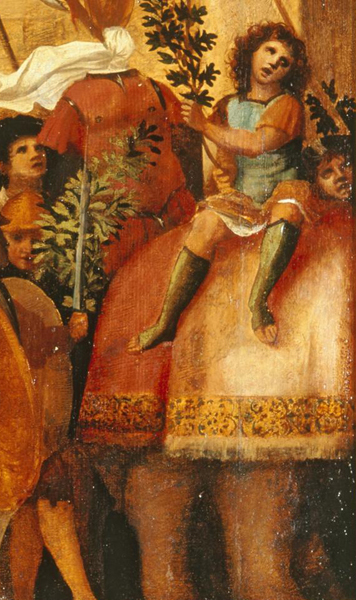 As in Biagio’s Triumph of Camillus, contemporary Florentine pageants and processions may have influenced the festive imagery, but discrete details appear to derive from authentic Roman sources. For example, Caesar’s laurel-wreathed head imitates the clearly incised, low-relief profile portraits in ancient coins, medals, and gems. 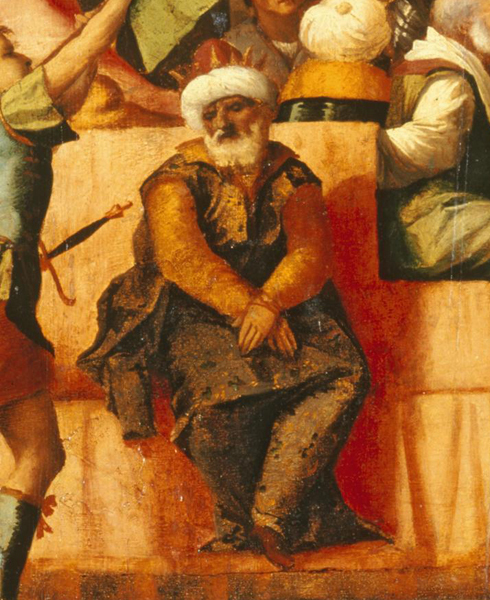 A well-known Trajanic statue of a Barbarian captive may have provided the model for the captured Ottoman in exotic turban and full beard who sits in sad submission on Caesar’s car. 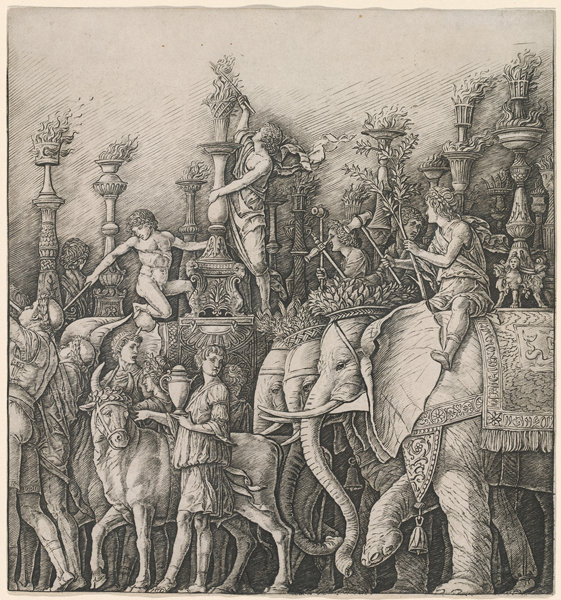 Ancient literary accounts of Roman triumphs presumably informed other details, such as the elephant at far right, which recalls Suetonius’s description of the lamp-bearing pachyderms that illuminated Caesar’s triumph. 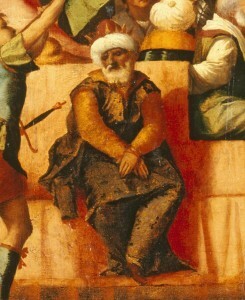 Painters were aided in their historical reconstructions by modern compilations of antique sources, such as Flavio Biondo’s Roma triumphans, published in Mantua in 1472. Alternatively, many accessed the authentic material at second hand, through Mantegna’s Triumphs of Caesar (c. 1486–1505). 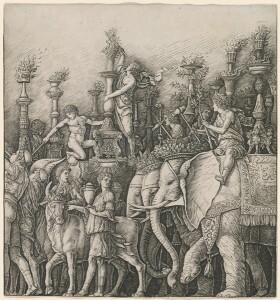 This ambitious series of nine paintings representing a victory procession in imperial Rome was unprecedented in its meticulous archaeological approach to historical reconstruction. Mantegna’s patron, Francesco Gonzaga (1466–1519), declared the images “almost alive and breathing, so that the subject seems not to be represented, but actually to exist.”6 Enthusiastically admired by those who had an opportunity to see the paintings at the Gonzaga palace near Mantua, they became even more widely influential through engravings, woodcuts, and painted copies.